This self-portrait tutorial offers an alternative, do-it-yourself method when you don’t have an assistant to help you capture the shot. I’ve provided a list of the camera gear, plus step-by-step studio and camera setups. I used a basic 45° broad-lighting setup for the portrait above. This means my key (primary) light was positioned at a 45-degree angle to my face. My head was turned slightly away from the camera to illuminate the broad side of my face. In broad lighting, the subject’s nose is pointed away from the key light. 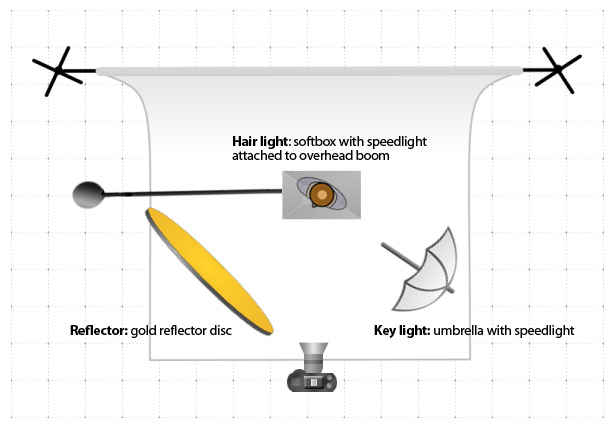 I also used an overhead soft box with speedlight suspended from a boom to create a hair light. Hair lighting provides even illumination of the hair and shoulders for better separation between the subject and background. Finally, I positioned a reflector disc attached to a light stand opposite the key light to add some fill light on the shadowed side of my face and neck. Adjust the height of the focus target, so the center of the target matches the height of your eyes when standing in your desired pose. With masking tape, mark on the stand where you want the bottom edge of the photo to cut off. Steps 1 and 2 help you frame your photo. Mark a tape ‘X’ directly underneath the vertical pole of the stand. Move the light stand out of the way and position yourself directly over the taped mark, such that your head is directly over the tape mark. Get into your posed position. Note the position of your feet by taping off the location of your feet. (I wore an open-heal Klog shoe in the studio. This allowed me to slip my feet out of the shoe and mark the exact position of my feet). Steps 4 and 5 help to ensure that your photo is in focus. Step out of position and move the focus target back into its marked position, so you can now focus the shot. Position your camera tripod and frame the shot with the focus target and tape mark on the stand. 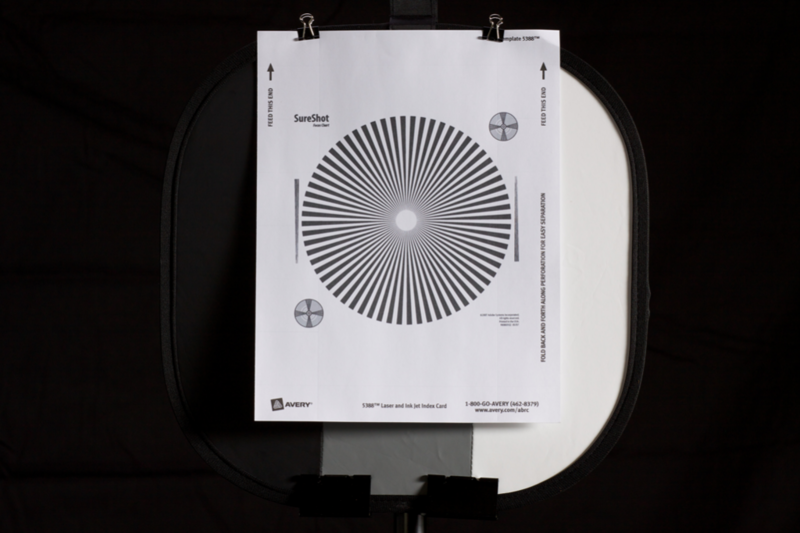 Adjust your focus ring until the focus target is crisp. Camera settings: My self-portrait was shot fast (1/200s) to expose the speedlight as the primary light source. In flash photography, the shutter speed controls ambient light. By shooting fast, you can filter out the ambient light. This allowed me to achieve a pure black background. My ISO was set to 200 and the aperture to f/7.1. I used this aperture setting so that my depth of field would allow for some leeway in focus, if I was slightly off the tape mark. Experiment with your camera settings, based on your own lighting situation. Move the focus target stand out of the camera’s field of view, prior to taking your self-portrait. Set the drive mode to the 10-second delay. Press the shutter and get into position before the shot. There is some trial and error involved before mastering this method, but it is effective and a relatively inexpensive technique. To learn about more sophisticated methods, have a look at the self-portrait episode of Digital Photography 1 on 1 from AdoramaTV. Happy shooting! Nice tutorial, Chris! I’m actually shooting staff portraits this week for work and this will definitely come in handy! GREAT post, Chris! I know of a wider audience that would truly love this post!! This will definitely be making it onto our LightStalking list for this week. Love the shot of you, too, here! Really well done! You’re really much better looking than I am! Thanks for the comments. I’m glad you found this post helpful. Nice one Chris. Lighting looks great! How will you break it to the Toad that the photo was actually of your better looking stunt double? Thanks for stopping by, Ashley. I think you’ll find this method works really well. Have fun with your self-portraits. What an excellent tutorial Chris. 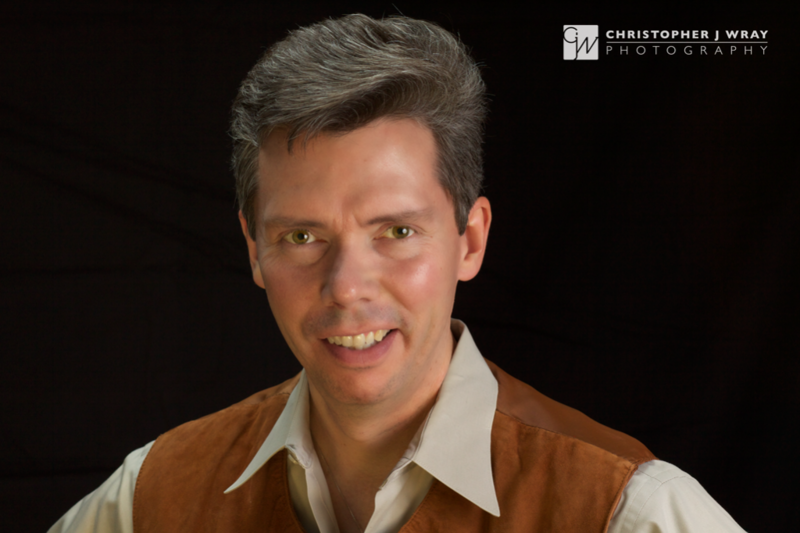 I had not heard of focus targets before, but that would certainly have helped me a lot in the past when taking self-portraits, which have been very hit-and-miss as far as focus is concerned. I really like your lighting, and the way you’ve been able to separate your hair for the background in a clear but not distracting way. Makes me realise though how much I still have to learn about flash and studio set-ups!